Hungry? If you’re in Maine, you’re in luck! 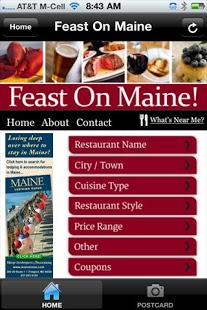 Feast On Maine offers a comprehensive dining guide to all Maine eateries. Whether you’re searching for an authentic seaside lobster dinner, a world-class dining experience prepared by one of Maine’s renowned chefs, or just a cup of joe, we’ll show you options from Ogunquit Beach to Moosehead Lake, Portland to Bangor, Acadia to Katahdin and every village, hamlet and township in between and beyond. Maine has a celebrated culinary scene and you’re just a click away from more than 3,000 restaurant listings. Search by restaurant name, city or town, cuisine type, restaurant style, price range – or choose the “What’s Near Me” feature for the closest dining options. Whether you’re a local or your visiting Maine on vacation you’re bound to work up an appetite enjoying all that Maine has to offer. 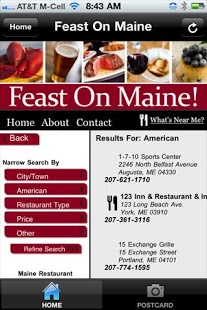 Find your next meal with Feast On Maine! Maine food pairs well with: summer the ocean beaches boating kayaking foliage canoeing sailing camping beach going skiing hiking biking winter snowmobiling surfing sea waves autumn leaf peeping snowboarding fall spring leaves. Endulge in culinary delights such as: clam chowder lobster diner shore dinner lobster roll fried clam clams steamers steak brew beer cocktail microbrew ice cream gelato blueberry pie wine pizza sandwiches seafood coffee java . If you’re interests include: cuisine gastronomy edibles provisions food spirits liquor or alcohol ; if you’re looking for: nourishment foodservice something tasty delicious savory flavorful nutritious ; if you’re staying at a: cottage cabin motel inn bed and breakfast or hotel ; if you’re a: foodie ( foody ) culinarian ; if you’re looking for: a reservation chef sommelier winery drink vineyard menu sandwich or a cook , a place to dine or eat or , nutrition or an ingredient ; if you want: to nosh chow, a taste bite spoon fork knife plate napkin, farm to table meals , reservations– simply put, if you want to savor the flavor of Maine, you’ll love Feast On Maine! Casual family style fast food takeout take out take-out breakfast brunch lunch supper dinner fast food drive through: it’s all at your fingertips! Enjoy: Chinese Indian Italian Japanese Sushi Mexican Pizzeria Thai Vegan Vegetarian café cafe brewpub microbrewery gastro pub lobster shack bakery steakhouse a bar bars nightclub deli delicatessen cocktails hors d’oeuvres appetizers dessert something locally grown or foraged or baked ( grow forage bake ) tavern public house coffee shop.